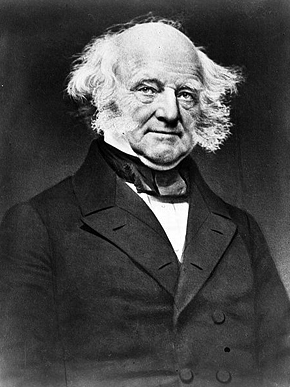 Martin Van Buren (1782-1862) was the eighth president of the United States, holding office from 1837-1841. He grew up speaking Dutch and practiced law in New York before his election to the U.S. Senate in 1821. In 1827 President Andrew Jackson appointed him Secretary of State, and Van Buren was Jackson's chosen successor as the Democratic nominee for president. His suspected opposition to slavery lost him his earlier southern support.